BUFFALO – The Sabres officially have the 2016 NHL Entry Draft. They plan to bid on an NHL All-Star game. The team has already secured the league’s scouting combine for the next two years. Hmmm, what other big event could be in the works? NHL commissioner Gary Bettman said owner Terry Pegula and his wife, Kim, mentioned Monday the Sabres would be interested in hosting another outdoor game. The Sabres had the first Winter Classic in 2008 at Ralph Wilson Stadium, a venue the Pegulas now operate as the Buffalo Bills’ owners. 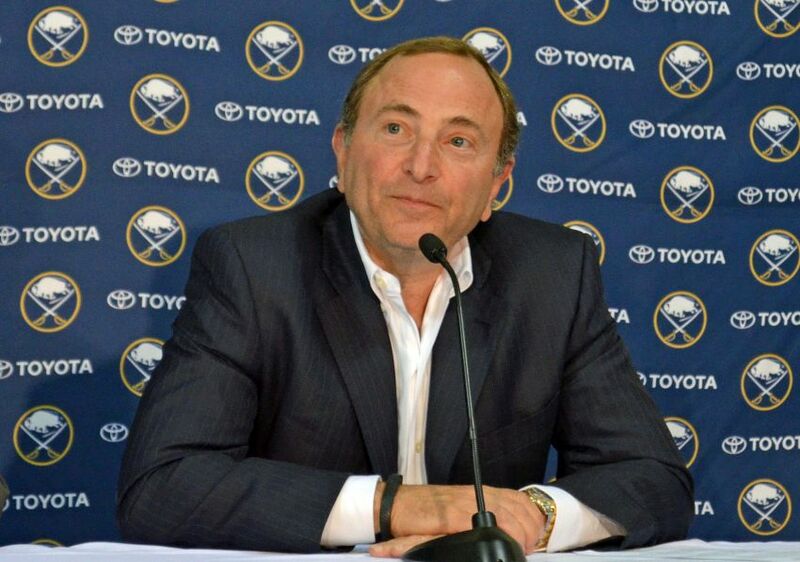 Bettman, who was in town for the draft announcement, has a long history of supporting Buffalo. When the Sabres went bankrupt in 2003, he stood by as the franchise trudged on without an owner. These days, the Sabres have an owner pouring money into the city and team. The HarborCenter rink facility connected to the First Niagara Center is scheduled to open in a few weeks. When the Sabres submit a formal application for the NHL All-Star game – team president Ted Black said they will – “Buffalo will get strong consideration,” Bettman said. “We do not have a specific timetable,” Bettman said. The Sabres hosted one game, in 1978. They held the draft in 1991 and 1998. – On the recent draft lottery changes – most notably, the odds of the last-place team getting the No. 1 pick have decreased from 25 percent to 20: “The competitive balance we have is so great the differences were not as profound as the way we had it laid out before. Sabres players attended the Buffalo Bills’ 37-22 loss to the New England Patriots on Sunday at Ralph Wilson Stadium, the Pegulas’ first game as Bills owners. Shouldn’t the Sabres be able to score some free tickets now? “We might have the inside track on some of the freebies once in a while,” Nolan joked. The Sabres made one lineup change, inserting Brian Flynn for injured winger Marcus Foligno, who could play tonight in Carolina against the Hurricanes, Nolan said. Notes: Sabres rookie Sam Reinhart lost all 11 faceoffs he took Monday. … Sabres winger Matt Moulson played his 400th NHL game. … The Sabres passed out “One Buffalo” shirts like Bills fans received Sunday. Wouldn’t a Sabres vs Maples Leafs game outdoors at the Ralph just make sense. Two rivals teams in a massive setting.